Does being connected help in being recognized? 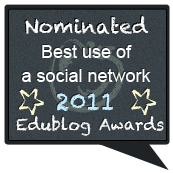 I was doubly honored at the Awards in its first year. 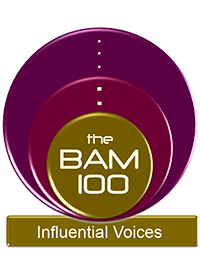 I was asked to present an award in the Most Outstanding Education Blogger category, and I was recognized along with 19 other Bloggers as Outstanding Education Bloggers to be recognized by the Bammy Awards. 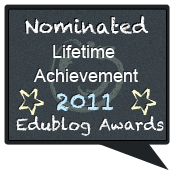 The stage was filled with educator bloggers who I read, respect, and from whom I try to recruit guest Blog posts for SmartBlog on a regular basis. 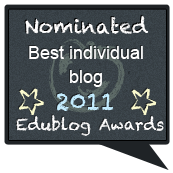 A great number of those recognized are regular contributors to SmartBlog for Education. 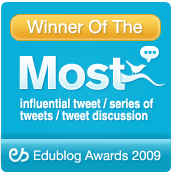 Connected educators from around the world would recognize the twitter names of those honored. These are their real world names: Adam Bellow, Angela Maiers, Chris Lehmann, Deven Black, Erin Klein, George Couros, Joyce Valenza, Kelly Tenkley, Joan Young, Kyle Pace, Lisa Nielsen, Mary Beth Hertz, Nicholas Provenzano, Patrick Larkin, Shannon Miller, Shelly Blake-Plock, Sheryl Nussbaum-Beach, Shelly Terrell, Steven Anderson, Eric Sheninger, Joe Mazza, and Tom Whitby. I know and respect each of these people as individual educators. They each continually contribute and share ideas to move education forward. And now to the point, I asked most of them a single question that has always plagued me ever since I became connected. Do the people in your own district know who you are in the connected world? With few exceptions the answer is “No, they have no idea”. The very people, who connected educators look to as the contributors of ideas to the global discussion on education, are not recognized by their own peers. They have to fight in their own districts for the same things we all fight for. Their notoriety and celebrity in the connected world carries no weight whatsoever in the unconnected. They struggle to get permission to attend the very education conferences that they power with their presentations. They are looked up to by connected superintendents, yet may go unrecognized and undervalued by their own principals. How did we get here? What is it about being an unconnected educator that sets out a different set of values than those for connected educators? What makes a person valued in one education setting and unrecognized in another? 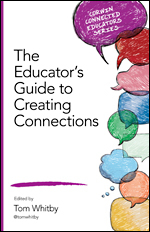 What makes the connected world of educators so different from the unconnected? It is upsetting to me that there are two conversations going on in education. There are two sets of values now in education. Of course, I am counting on the readers of this post to be connected and understanding and appreciating all that I have said. The sad truth is that a majority of our colleagues don’t get it and never will until they become connected. 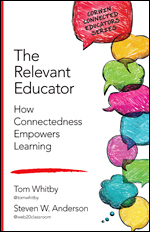 Being connected is an opportunity for educators to learn and maintain relevance. It is not arrogance or conceit to think this way, but rather the result of a technology-driven world where collaboration through social media can be a tool for the common good. We need to work harder at getting people to connect, if we want to move forward at a faster pace to reform. I also like the celebrity sometimes. Great post as always Tom. I agree that being connected is essential. 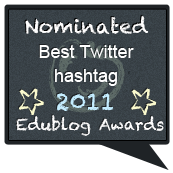 As a connected educator, I feel as though I am abreast of the latest issues and trends in education. A year ago, Dr. Todd Whitaker came to speak here in Oklahoma among 300 educators. He talked briefly about “teachers being under attack” and “new teacher evaluation frameworks” and every one in the room just looked puzzled. He asked, “You do know what I am talking about… right? The majority of educators nodded their heads. He replied, then you must not be on twitter. Later in the presentation, he asked the crowd, “Which country is considered to be the leading country in education in terms of test results?” Again, the room was quiet. 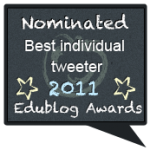 This year I am leading a new school and all my teachers (32) are on Twitter. I work to recognize what each individual teacher wants to learn, as well as, what they need to learn. 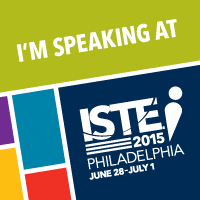 Then, I make every effort to spark their curiosity by sharing appropriate articles, videos, etc. I share with them the “Twitter Celebrities” in which they must follow relating to their particular subject matter. (You are always one of the first people I recommend). We have participated in #Edchat as a staff and they are beginning to understand the benefits of being connected.